← Birthday wishes for F.I.L. 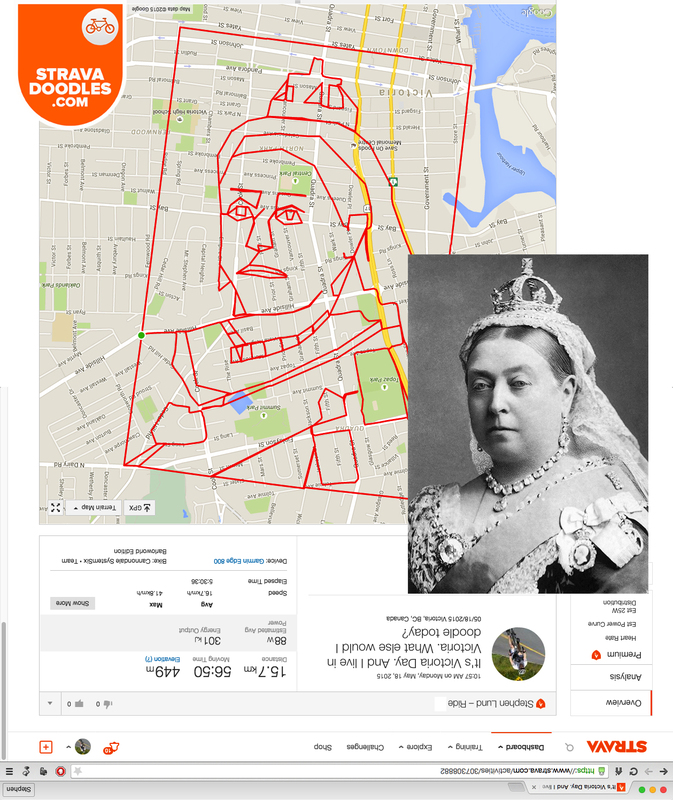 A portrait of Queen Victoria, doodled on Victoria Day 2015 in Victoria, BC by GPS artist Stephen Lund and his bicycle. Total distance cycled to create the portrait: around 85 kilometres. Today is Victoria Day – a Canadian holiday celebrated on the last Monday before May 25 in honour of Queen Victoria’s birthday. And I live in Victoria, British Columbia – a city named after Queen Victoria. It was only fitting, then, that I dedicate the day’s GPS doodle to Queen Victoria, the longest reigning British Monarch (63 years, 216 days) and great-great-grandmother of Queen Elizabeth II (whose current reign of 63 years, 101 days is a very close second). I’m not entirely thrilled with the portrait – I feel my GPS doodle of Queen Elizabeth II a couple weeks ago was a much better likeness. But until Victoria Day 2016, it’ll have to do. This entry was posted in gps art and tagged bicycle, bicycling, British Monarchy, Commonwealth, creativity, cycling, cyclist, garmin, gps, gps art, portrait, Queen Victoria, royalty, strava, strava art, The Queen, victoria bc, Victoria Day. Bookmark the permalink.